I recently went to Adorabelle Tea Room, located in a heritage building that used to be the Old Courthouse (built in 1925). If you’ve never been to Steveston Village before, which is part of the city of Richmond, it’s a very quaint waterfront community that almost makes you feel like you’ve gone back in time. Fun fact, Steveston was the location for many of the Storybrooke scenes in ABC’s Once Upon A Time. 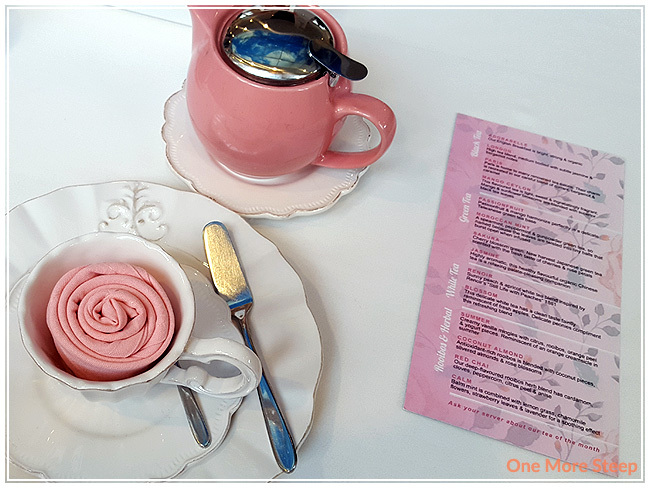 I made a date with a friend to go to Adorabelle Tea Room because I just wanted to go out for afternoon tea, and who doesn’t want to spend the day in Steveston? 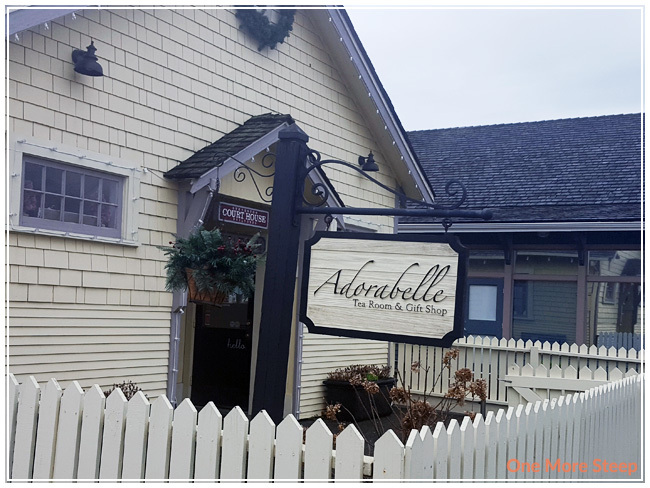 There’s both paid parking lots and street parking available around Adorabelle Tea Room and throughout Steveston – I lucked into a spot just metres away from the door. 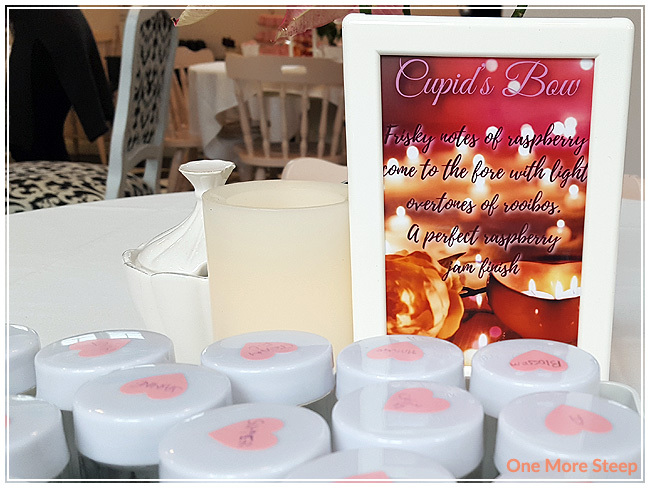 We were seated quite quickly, and the table settings were just darling – everything pink, white, and silver. We were presented with a tray of tea samples to sniff and a menu. 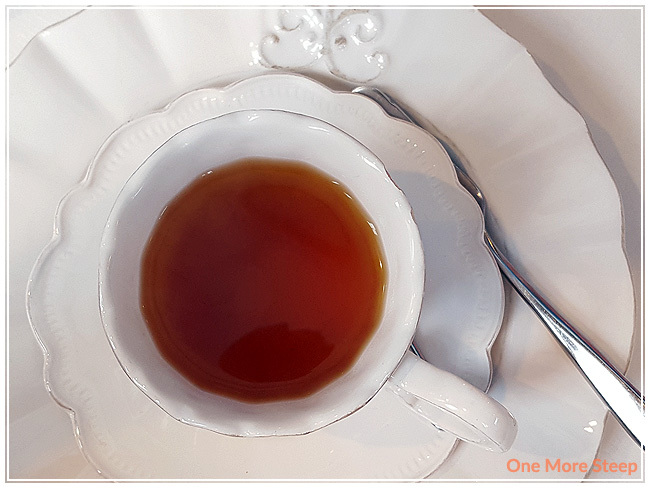 The tea of the month was called Cupid’s Bow – rooibos blend with raspberry notes. I opted to try London, a flavoured black tea with jasmine and bergamot. My friend picked a Japanese green tea blend called Sakura, which had cherries and rose petals. Our food came out on a lovely three-tier tea stand. 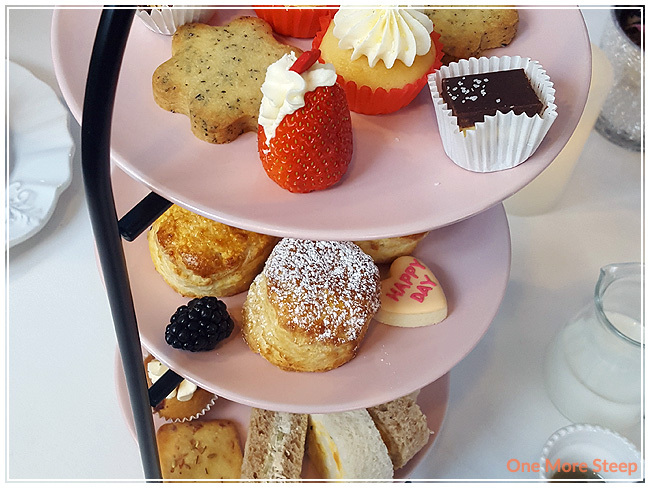 As with most afternoon tea places, Adorabelle Tea Room has savouries on the bottom, scones in the middle, and sweets on top. On the savouries plate, there was a pinwheel sandwich with ginger & carrot (I found it heavy on the ginger at times), a pinwheel egg salad sandwich, a chicken Waldorf salad sandwich, a fennel & Asiago shortbread, a chives & bacon cupcake, and a cucumber & cream cheese sandwich. My favourites from this tier was the chives & bacon cupcake and the fennel & Asiago shortbread. The middle tier was the scones! 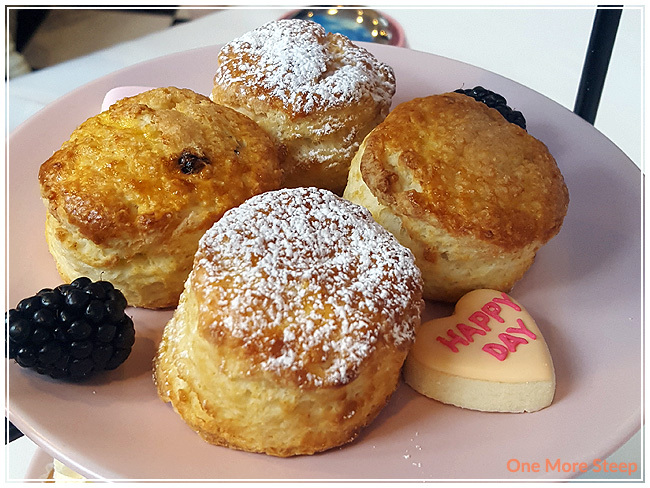 There was a lemon & blueberry scone and an scone with powdered sugar, along with blackberries, and cute conversation heart-styled sugar cookies (the sugar cookies were an extra for Valentine’s Day). Too cute! 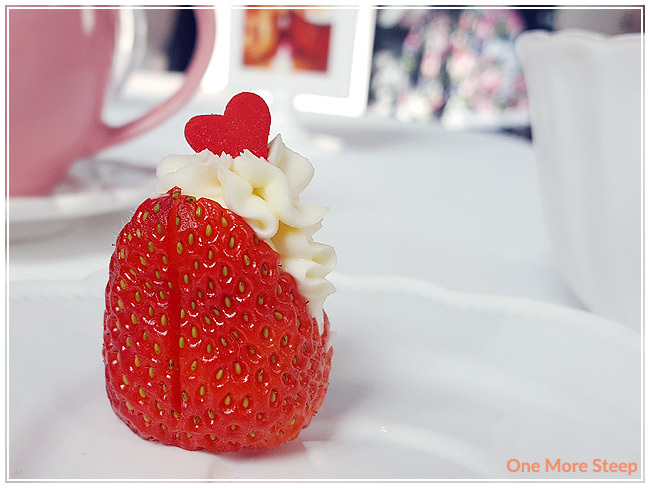 The scones were paired with strawberry preserves and a sweetened cream. I really enjoyed the lemon & blueberry scone from this tier. And finally, the desserts! The top tier is generally my favourite tier. 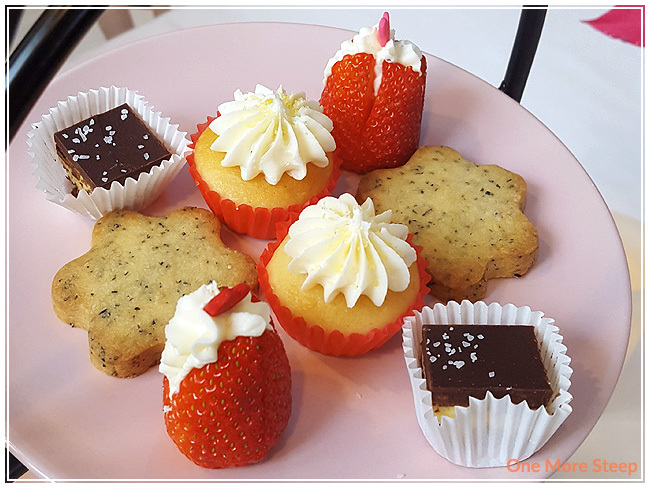 Here we have a strawberry with whipped cream, a cupcake with what tasted like a buttercream frosting, salted Nanaimo bar, and an Earl Grey shortbread cookie. My favourite part of this one was the strawberry with a sweetened cream cheese filling, and the salted Nanaimo bar – so good, so delicious. 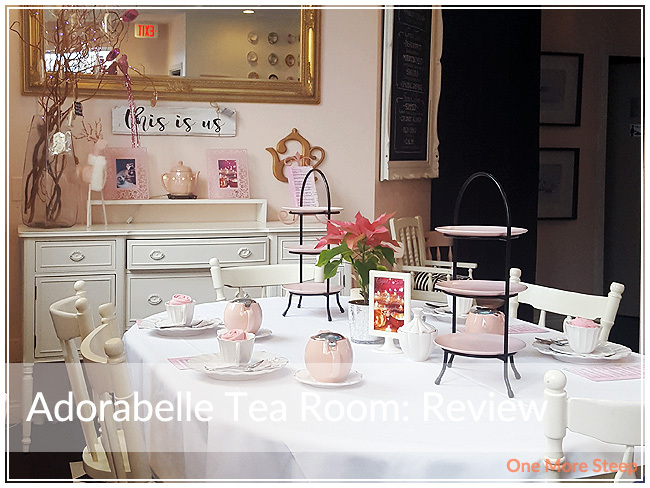 I had a really nice time at Adorabelle Tea Room. It’s almost like stepping into a very pink doll house, everything goes so well together and it was a wonderful experience. 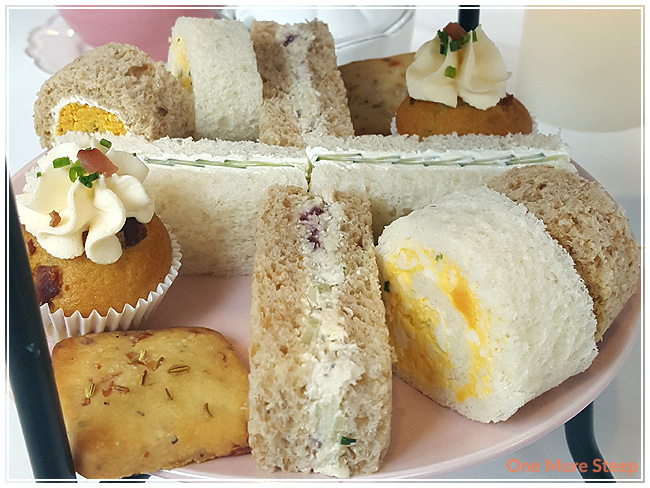 I really enjoyed the variety of food that was part of the afternoon tea, and the tea selection is quite extensive – ranging from herbal tisanes and rooibos to black and green tea blends. I loved the fact that they had a tea sampler for you to experience first prior to selecting the tea to go with your afternoon tea experience. The ladies that were running around were attentive to not only our table, but to the other guests as well. From the moment we walked in to when we were leaving, we were well taken care of and never felt rushed to finish up. I like the pink motif! The salted Nanaimo bar look very tasty.